In one of the best moments from the first season of HBO’s Deadwood, Jewel, the crippled woman who works for Al Swearengen, falls to the ground during a difficult trek to Doc Cochran’s hut. From the body language of an Asian woman who sweeps a nearby floor, it’s understood that the unspoken social customs of the time do not allow her to help Jewel up off the ground. Even if the grungy citizens of Deadwood’s Asian community have never been the focus of any one episode, their presence is always felt, and it is via tiny, often stunning observations like these that the show’s creators illuminate the marginalized role of minorities in America’s Old West. 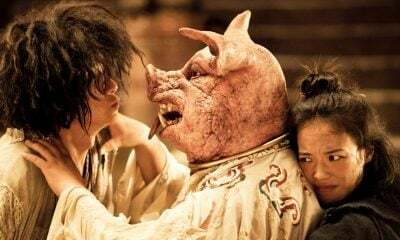 Though set in Canton, China in the 1940s, the world Stephen Chow envisions in Kung Fu Hustle may as well be a revisionist look at the life of Asian refugees in early America, because Chow uses the cinematic language of the present to playfully observe the social realities of the past. This is where Chow has an advantage over Quentin Tarantino, a poseur whose Kill Bill films seemingly footnote the same postmodern sources but fail to do so critically or with much fun. When Lucy Liu says in the first Kill Bill film, “Silly rabbit, Trix are for kids,” the gesture means nothing. When the less serious Chow references the iconic language of America’s westerns, Road Runner cartoons, Abbott and Costello sketches, and sometimes Tarantino’s own movies, you don’t get the feeling that the director is just in it to flatter his audience’s pop-cultural acumen. Instead, these references playfully shed light on the social roles and expectations of men and women in China’s past while celebrating the camaraderie of a group collective. 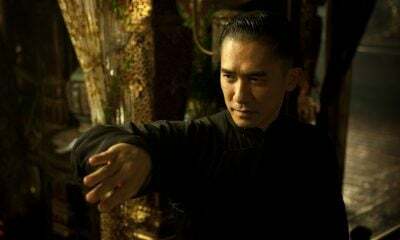 In the film, a community of people in and around an apartment complex defend their turf against members of the Axe Gang, a group a wannabe gangster played by Chow wishes to join. Like Shaolin Soccer, the film is positively insane, a genre-defying spectacle of postmodern signs colliding at rates seemingly faster than the speed of light; indeed, watching Chow’s characters negotiate the colorful obstacles in their immediate environment is not unlike watching a ball speeding its way through a pinball machine. At some point after the film’s halfway mark, any semblance of a plot completely disintegrates, but the gut-busting gags and elaborate non sequiturs never cease and still work to remind us that the strength of the film’s social perspective is matched only by the goofy elegance of its humor.